Goa News |Remo gets a 'rebirth'; Social Media ‘kills’ him! Yes, it was a shocking news for all the Goans; in Goa as well as those spread all over the world. 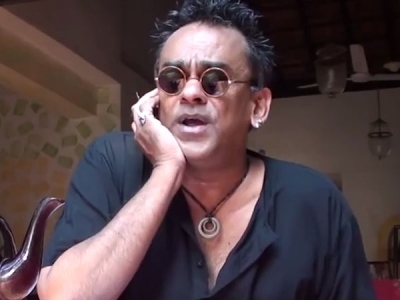 Remo Fernandes dies of a heart attack! The post went viral in the morning on 25th Septemebr 2017, saying Goa’s world famous pop singer died of a heart attack early morning. No chance to confirm as Remo nowadays lives in Porto, Portugal and it is 4.30 hours behind Goa (India). Perhaps Remo was fast asleep in Porto when the news was going viral in Goa! 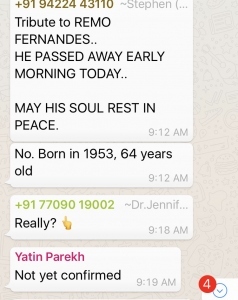 The WhatsApp message simply paid a tribute to him and the forwards made friends of Remo as well as the media panic. As Remo woke up in Porto, he too found his sms mailbox and WhatsApp full of messages, either informing him about the ‘fake news’ or simply trying to confirm: hey buddy, how are you? And finally Remo decided to clarify the matter, but in a typical Remo Estyle! The matter got clarified by 4 pm in India (around 11.30 am in Portugal). But a 17-year old news of goanews: “Goa mourns for Remo's musicians” was simply going viral with over 10,000 hits within few hours. Hope this news goes more viral, clarifying the matter that our dear Remo is alive and continues rocking!! !